German Vice Chancellor Sigmar Gabriel addresses the 72nd United Nations General Assembly at U.N. headquarters in New York, U.S., September 21, 2017. BERLIN - If the United States terminates the Iran nuclear deal or reimposes sanctions on Tehran it could result in Iran developing nuclear weapons and raise the danger of war close to Europe, Germany’s foreign minister said on Saturday. U.S. President Donald Trump refused on Friday to formally certify that Tehran was complying with the 2015 accord even though international inspectors say it is. He warned he might ultimately terminate the agreement. 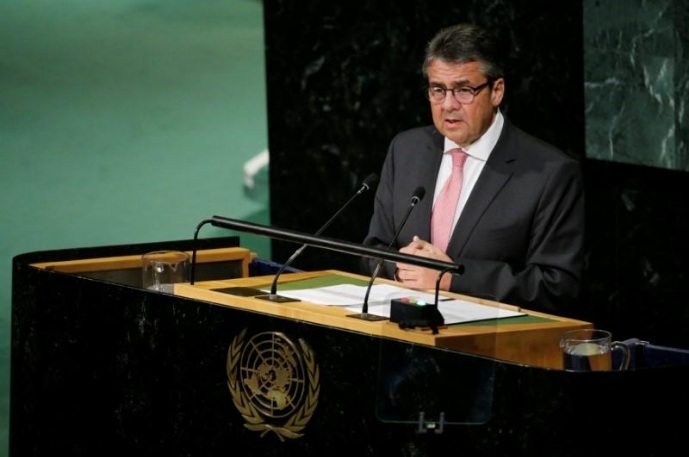 German Foreign Minister Sigmar Gabriel told Deutschlandfunk radio that Trump had sent a “difficult and dangerous signal” when the U.S. administration was also dealing with the North Korea nuclear crisis. “My big concern is that what is happening in Iran or with Iran from the U.S. perspective will not remain an Iranian issue but many others in the world will consider whether they themselves should acquire nuclear weapons too given that such agreements are being destroyed,” Gabriel said. “And then our children and grandchildren will grow up in a very dangerous world,” he said. He said if the United States terminated the deal or if sanctions were reimposed on Tehran, it would give Iranian hardliners, who are against negotiations with the West, the upper hand. “Then they might revert to developing nuclear weapons,” Gabriel said, adding Israel would not tolerate that and “then we will be back where we were 10, 12 years ago with the danger of war relatively close to Europe”. He urged the United States not to endanger the security of its allies and its own people for domestic policy reasons. Hailed by Trump’s predecessor Barack Obama as key to stopping Iran from building a nuclear bomb, the deal was also signed by China, France, Russia, Britain, Germany and the European Union. European allies have warned of a split with Washington over the nuclear agreement and say that putting it in limbo undermines U.S. credibility abroad. Trump has given the U.S. Congress 60 days to decide whether to reinstate economic sanctions on Iran that were lifted in 2016. If the United States terminates the Iran nuclear deal or reimposes sanctions on Tehran it could result in Iran developing nuclear weapons and raise the danger of war close to Europe, Germany’s foreign minister said on Saturday.